This has become my go-to granola. I don’t make many others, except for my chocolate chip – peanut butter granola, but I always keep a batch of this one on hand because it’s hands-down (if you’re excuse the pun) the best I’ve had. Curiously, this granola recipe uses apples as a base, replacing much of the oil found in other granolas. I had picked a bunch of apples in the countryside and put a few to good use in this granola. The rest? They went to apple jelly, speaking of breakfast. Yet as the seasons passed, I found that I could use other unsweetened fruit purees instead of the unsweetened applesauce that the original recipe by Nigella Lawson calls for. Peach, nectarine, pear, and banana puree have all been successfully stirred into the mix. I use a multi-grain blend which I buy at the health food store, called flacons 5 céréales, which looks similar to old-fashioned rolled oats but contains wheat, oats, rye, rice, and barley. You can use regular rolled oats, but I think the mix makes the granola a bit more lively. I’ve used toasted and untoasted; both work fine. Of course, you can replace the almonds with walnuts, hazelnuts, pecans, or cashews. The other good thing about this granola is that It gets nice and clumpy, but not so much that you feel like you’re munching on a gravel pit. It’s also low in oil and barely sweet. I can’t resist nibbling on the big pieces the moment I pull it out of the oven. 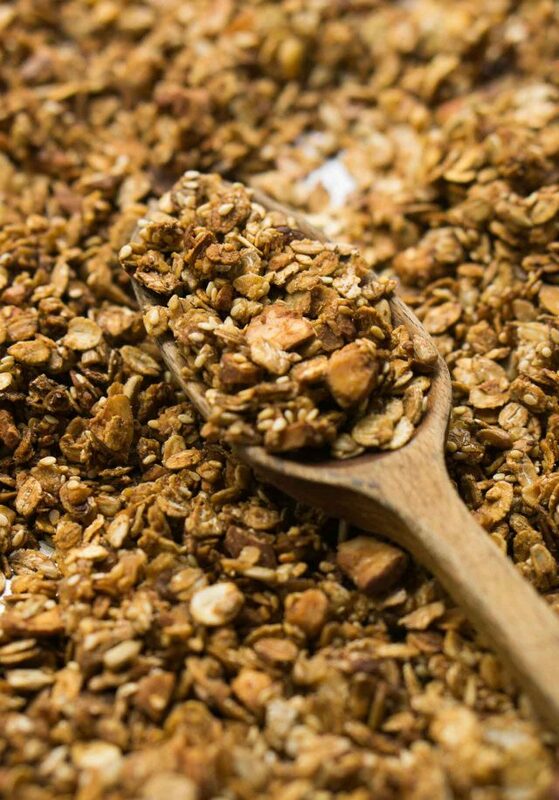 But really, it’s best to let it cool, when it becomes crispy and crunchy, like the best granola should be. And this is it. About the phone, You have probably some ways to get it no matter the insane contracts at Rance-Télécon, maybe the rule about the “slightiest change, 4 months ago or sooner, to the terms and conditions” applies ? The warm granola seems close to heaven, but I would totally choose the wiener ! it looks perfect. All the sauces and the size of the sausage ! (size DO matter.) I wish we have something like that in my hometown :) . I still haven’t gotten an iPhone. I am tempted to drop my existing phone in the toilet just so I need to go out and buy a new one (an iPhone of course). I am firmly convinced that all the best granola recipes are made with applesauce rather than oil. The applesauce makes the granola clump better and the granola doesn’t fall apart. The version I make has agave nectar rather than rice syrup but I could see, as you suggest, that the two are interchangeable. 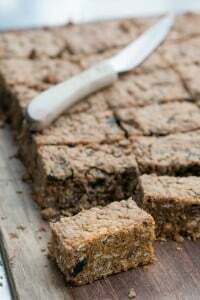 I have been eyeing Molly’s version of this recipe for years but haven’t made it because I fell in love with the version of granola at Baking Bites. But, maybe now that TWO of my favorite food bloggers are pushing this recipe, I will be forced to try it. Thanks for sharing. I like how straight forward this recipe is and I’m glad to hear your suggested substitutes for rice syrup and oil, the walnut and hazelnut variations are intriguing. Based on the photo of the hot dog and your recent visit to the bay area, I’m guessing that you stopped by at the San Francisco Costco. It’s such an American experience to stock up on bulk items and then top it off with a gargantuan $1.50 hot dog. LOL! This is my favourite recipe for granola too. It is a huge hit when we have hosted brunch parties and I have written out the recipe countless times. Thanks for your post. Now I can just forward a link! I wish I had seen your recipe before I browbeat my mom into shipping me a winter’s supply of her amazing granola. Given the shipping costs from Woodstock to Paris, it’ll probably go down in the books as the priciest granola ever. David – the granola looks incredible. I am a huge fan of granola and will have to try this very soon. I love the idea of adding a flavored nut oil to granola. What an excellent idea. I also really like the idea of using different fruit purees. I think there are as many recipes for granola out there as there are nuts in any given recipe, but I’ll have to give this one a shot. I recently posted my own recipe that is ‘sugar free’ – in that I don’t add any actual sugar, just natural sweeteners like honey, maple syrup and fruit juice. I know that it’s difficult to find maple syrup in France (a friend who was just visiting from France stocked up on Maple syrup while she was here), but I haven’t tried it with rice syrup, but I could imagine that you could easily substitute one for the other – though you would end up with a different flavor. On the days when I am working in other people’s gardens, I usually have granola and Greek yogurt for breakfast. Granola always holds me over ’til lunch as well as oatmeal, and it’s far more portable when I am running late, (cough). But I have never tried to make my own granola. Recently I have seen a few recipes on other food sites and now, here’s this one. It looks good but can I add more nuts? There is an organic granola at my food coop – I really like it – called Rainforest Crunch. I like the high ratio of nuts to other grains – I think the fat and protein help get me through the day when I am digging and doing intense physical work. Do you think adding more nuts, (or dried fruit), will ruin the balance in this recipe? angry if I had to toss them out if they were rancid! Michaela: I’m sure you could add more nuts, although I think the balance is just right for my taste. Some of those store-bought granolas you can buy are really loaded with stuff that you might not want to consume (which is probably why they taste so good! ), even if you buy them in natural food stores. Akila: I’ve used agave with much success. There have been concerns about the health claims of agave nectar recently, although I don’t consume a lot of it. I do love maple syrup, though, and perhaps will use some next time. 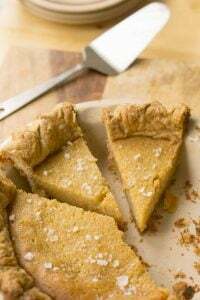 Julie: I would imagine pumpkin butter would work, although I would thin it with water or fruit juice to get it to the consistency of applesauce so you can mix it in with the other ingredients. I also live in Paris and have a terrible time finding decent oats; instant quaker mush (err I mean oats) just don’t cut it. Where can I find flacons 5 céréales? Hi Lili: You can get them at the natural food stores, like Naturalia and Biocoop/Lemo in France. For addresses and websites, check out my page: Ingredients for American Baking in Paris. I know that hot dog! If you come anywhere near here (pittsburgh) on a trip I would be happy to take you that store. Did you ever try the pistachios? Lucky you came when you did they were out of Pecans for much of the summer. Maybe you could convince them to carry your books. I’ve been making granola for years using the recipe from Timberlline Lodge, but based on your recommendation, will try this on the weekend. Looking forward to reviewing it. I made the carmelized Vietnamese pork ribs last night…yum. Every recipe on your site that I’ve tried is wonderful….thanks for the inspiration! Hotdogs are best eaten in a wrapper like this one. I love Costco hot dogs. This granola sounds delicious. Now I want to go find Plum Kernel oil. I’ve never even heard of it. Any ideas for adding bulk to granola without nuts? We can do the sunflower and sesame seeds but I have a kid with a nut allergy. (It’s criminal, really. Why couldn’t he be allergic to something gross instead of one of the most delicious things ever?) But I find it difficult to find things to add some crunch and substance. Thanks, as always, for generously sharing your incredible recipes. It’s interesting the things you take for granted. My now 94 year-old grandmother in East Texas has 5 pecan trees around her house. Growing up, we would go there for Thanksgiving and come home with several gallon-sized bags filled with pecans that she had gathered, cracked and picked over. Needless to say, our holidays were filled with various pecan treats. As she’s gotten older, we no longer get full-service pecan delivery. Until just a couple of years ago, she would gather the pecans and when we went up there, we would take them to a “cracking house” (note that’s not quite the same thing as a crack house–but it could be just as addictive). They load the pecans in a big machine that cracks the shells. It also smashes more of the pecans than my grandmother did when she cracked them by hand. Then we’d take them back to her house and we’d all sit around shelling pecans. Now we pretty much do all the work ourselves. But we still end up with oodles of those yummy small native pecans. As it becomes more and more obvious that this won’t go on forever, I relish those pecans even more. Thanks so much for this recipe David. I’m excited to try it! Since having to go gluten-free a few years ago, I haven’t been able to eat store bought granola. I’ve just discovered certified gluten free oats, and have been planning to make granola. I just haven’t got around to finding a recipe. I love the idea of the fruit puree. Can’t wait to try it! I have been spending my days at a hospital where my father is recovering from surgery. I cannot tell you how good this granola sounds to me right now. I have been eating hospital food this entire week and it’s really starting to take its toll on me ( I did have yogurt with granola in the cafeteria yesterday, but immediately followed it with cheese curls. I think my choices are a result of sleep deprivation). Looking forward to going back home and making Nigella’s granola. I’ve been looking for a good granola recipe. I can’t wait to try this one out. Thanks for the recette David! I am an avid granola-maker (that makes me sound like a complete dork but I think I’m okay with that) and I’m always trying new things on the granola front. Surprisingly I have never tried Nigella’s even though she is without a doubt my favourite bedtime reading. This summer I brought my homemade granola to our family in France and I think they liked it, but they don’t really seem to do breakfast, just a bowl of coffee usually. Definitely going to try this on the weekend! This looks amazingly delicious! I used to love granola, but haven’t had much since going gluten free. This looks like an easy recipe to adapt! Thanks =D. I’ve been using Alton Brown’s recipe for granola ever since the first time I made it–it always gets great reviews–but I might try this one next time. Or replace some of the oil in the recipe with applesauce. Good idea using rice syrup, that stuff is magical! I use it to make some highly addictive peanut butter bars. Was on a granola kick this summer and made some amazing dark chocolate, coconut and hazelnut granola. As good in the morning as it was for dessert! Love the idea of subbing fruit puree for oil. Homemade granola is great, but honestly, I’ve always been a bit turned off by the amount of oil in most recipes. Now that I’ve seen this recipe, it seems such an obvious substitution! Can’t wait to give this a try. Look at David, braving the Costco hot dog line! I don’t know how you managed to combine hot dogs and granola, either, but you did! I’m loving this recipe because it’s so friggin’ healthy!! Perfect for those times when you must, reluctantly, go on Le Regime! This one’s going into the recipe file–Thanks! thanks for the fun post on Granola… I’ve many fond memories as a kid of my dad making his particular recipe… the aroma was always phenomenal. I used to make my own batches several times a year… and need to get back at it! 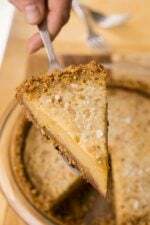 Your pecan comment reminded me: in the mid ’90s I was an exchange student in southern Belgium (Tournai) – that fall another American student and I thought we’d make a classic American Thanksgiving dinner with all the fix’ins for our host families… Being a South Carolinian he was going to make cornbread stuffing and pecan pie. Turns out Karo Syrup and Pecans were never found that side of the pond, and instead had to be imported via parcel post! The dinner was fun, but young pups that we were, we did not realize just how long it takes to roast a turkey – needless to say our Belgians parents enjoyed plenty of wine before we finally sat to eat – rather late that night! thanks for all your fun recipes and stories! Dawn: Thanks for sleuthing that down. Some places carry it, then inexplicably, stop carrying it. I saw that Amazon also carries a apricot kernel oil, which they say if for culinary uses, but you do want to get a good brand that has that fantastic smell and taste of bitter almonds. The one I have is pressed by Perles de Gascogne, and is great, although I don’t know where it’s available outside for France. Been there, done that. There’s countless granola recipes in books and online. I always make it, but usually come back to the basic. These articles like above are rediculous, because they overlook every day taste, as well as economy. Give it a few weeks or months and you will be sick of it all. Which is why he was most likely fascinateded with the BIG hot dog. Go figure. Lots of sauce and condiments does not make everything better. What’s the idea behind granola, anyway. Forget the fancy excess… Keep it simple. Have a nice day. YUM! This looks amazing. I never would have thought to use applesauce instead of oil! You might as well drink the wine from the bottle. The hot dog in the photo has ketchup on it, and that is a sin against nature! Mustard, and whole lots of other things go on a dog, but not ketchup….c’est pour frites! Love Love Love the homemade granola! Never thought of doing fruit puree in place of the oil but I’m anxious to try it…I can see that it would do more for the crispiness than the oil would. And the membership warehouse stores are indeed the best place for the nuts! Especially and Christmastime, I’m in there for the bi gbags of walnuts, almond and pecans. And don’t forget – that $1.50 wiener came with a beverage! We had it for lunch on Saturday and it never ceases to amaze me! Hi David…….why won’t they let you have an iPhone? Don’t you just love that “c’est pas possible” ?!!! Re: the Costco hot dogs (or smoked sausage, if you prefer! )…..you can ask for sauerkraut with it, but a lot of people don’t know that. It took me a long time to come up with my “best” granola recipebut I use apple juice concentrate & agave (now and then maple syrup or honey) but no oil or sugar. The other day I added pumpkin for a little seasonal flair. I thought of myself when you wrote about Americans and too much cinnamon in “The Sweet Life in Paris” :) Thanks for posting your version. I will surely be making this over the weekend. I have a large bag of rolled oats and I wasn’t sure what to do with them – now I do! I’ve given this recipe to a half dozen friends and they all love it, too. As a variation, I usually throw in about a cup of cereal, too, either mulitbran chex or some cheerios. Another addition which adds some interesting texture is low fat, unsweetened shredded coconut. I play around with the sweeteners, sometimes using maple syrup in addition to or instead of the honey. Mmm, mmm good. Hi David, this is my favourite Granola recipe too! I’ve been making it for a few years from Nigella’s book and it’s fantastic. I’ve only ever tried it with applesauce so it was interesting to read about other variations. I’ve made it with all kinds of nuts and it’s always delicious. Ooh, I am all over this! I make granola quite often, and that might be because I love to pick out all the extra crispy chunks and remarkably the batches disappear fast! I always play around with different types and proportions of nuts/seeds/oats, don’t bother with dried fruit much anymore, just gets in the way. I use maple syrup, different sugars and my best lately was with a ton of extra virgin olive oil. But I’ve never tried applesauce. So guess what I’m doing this weekend? Thanks for sharing the recipe! From your post and the comments, it sounds like I just MUST make this recipe! My daughter would love it for sure, especially if I sweeten it a little more. I am laughing out loud at the big picture of the (Costco) hot dog. Too funny. Guess you passed on the Churro. This recipe is so great! I didn’t have applesauce so I substituted with a rather ancient jar of chestnut jam languishing in the back of my fridge. I cut out the sugar and added a bit of vanilla too, now my house smells amazing! Kris: I also passed on those chicken whatever-they’re-called as well! jessica: It’s fine to keep nuts in the freezer, but my freezer is packed with ice cream, and a few other things. If I had room, I’d certainly keep them in there. Adele: Good to know. I did try replacing the sesame seeds with unsweetened coconut, but it wasn’t as good, for some reason. Never though of adding Chex~cool! there are 17 costcos in england, 3 in scotland, and 1 in wales. Granola is a food of the gods. It’s been ages since I’ve made any, but it won’t be eons before I try this recipe. Applesauce? Sheer genius. Genius, pure and simple. 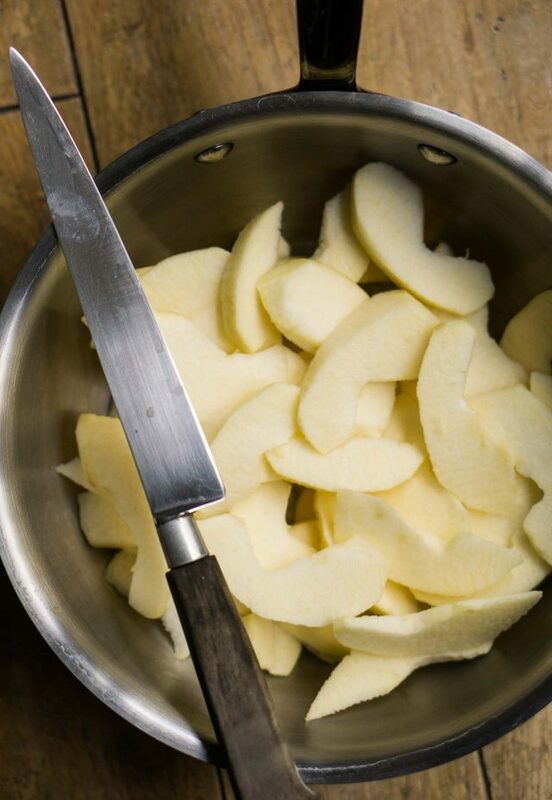 Tis the season of apples, stateside, pears, too. Hmmm..I’m thinking this granola might be good using baby food apricot (or pureed from canned apricots) and work in some almond paste instead of the other sweetners. Would it work, do you think? Susan: Baby food would work well, but as for the almond paste, I would imagine it would prevent the granola from getting crispy as it’s quite oily. singingwater: Well, they haven’t made it to France yet, although we do have Metro, a membership-only store which is only open to professionals. It’s not super-cheap like Costco, but they do have a lot of stuff. And I love the enormous walk-in cheese refrigerator, which is about the size of two tennis courts, and they have down jackets for you to wear inside. In there, they have every kind of cheese imaginable. But I stock up on French butter…and lots of it! elemjay: Someone else mentioned dried fruit and the problem is that if you add it while the granola is warm, the pieces get very tough and hard. If you add them later, and store the granola, their humidity can make the granola soft. So I prefer to add dried fruit to the bowl, just before I eat it. Hi David, this is specifically with reference to your link regarding safety concerns of Agave in the Wall Street Journal. The Sugar Lobby is extremely rich and politically powerful the world over. which is why the “white poison” is never questioned as much as it should be. I don’t have anything against sugar – I use it as much as anyone else, knowing fully well it is the least healthy of all sweeteners. However, it may help if all of us questioned all the anti-other sweetener wave that has been unleashed on by the sugar lobby. White sugar, as we know it, has been around for 200 years. (It is a product of the industrial revolution.) Before this, sweeteners were unrefined syrups – molasses, maple, agave, dates, or unrefined solids – palm & cane jaggery or even fresh & dried fruits – grape, beet, dates or leaves – steevia. This has been going on for 1000’s of years and we have evolved thus far on their merits! Surely, they are better than white sugar. On another note – this is a poorly written article. One cannot compare a tsp of sugar with a tsp of liquid! like to like comparison for calorific value is grams. One gram of fructose can ONLY have 4 calories! All sweeteners contain either one or a combination of these – Glucose, Fructose or sucrose. The difference between white sugar and the others is: sugar is only sweetener & contains none of trace elements / minerals / vitamins that others contain! And flavour wise, it is the poorest of all sweeteners. The quantity of sweetener used is a function of both individual taste & its inherent sweetness per measure. I know you mean well… just bringing to your notice some of the mal-practices that the food industry actively perpetrates for its gains! It looks wonderful David. I’ve never been really big on granola, but occasionally I like it on my yogurt. Will have to give this a try, thanks! Mmmm this sounds delicious! And as a pretty crunchy person, I love granola! And my husband, who constantly complains that granola is too expensive and I buy too much, will appreciate my making my own! This looks delicious. I’d have to adapt it a bit to make it gluten-free for our household, but not much – I have gluten-free oats now! And I love the applesauce idea. 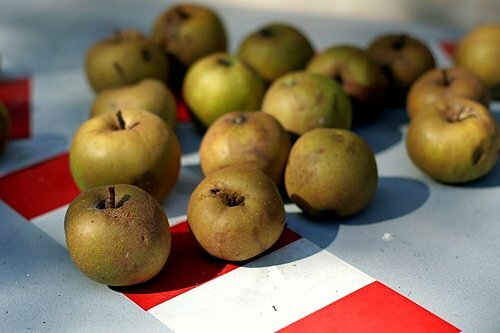 I have bunches of frozen pears from earlier in the season, I should make some into pear-sauce, and use it here! And sad to say, that hot dog looks might good. I love granola. I never tried making it, it looks more fun this way and you can add what you want to it. I’ve found that freshly squeezed orange juice works really nicely as does fruit nectar. My mum used to make a granola recipe in the 80s (most likely called muesli here in Australia) that had a puree of dates and water instead of a sweetener. I think I might experiment with it soon. David I was wondering if you could share any advice on creating granola clusters? ha ha, were people staring at you as you took that hotdog pic? granola looks yummy, I’ll have to give that a try. thanks for posting it. Sigh. I just had the worst lunch ever, and would kill to have a bag of this in my office right now. Looks so good! I don’t know if there a national granola day, but I just learned from one of my Facebook friends that yesterday was National Oatmeal Day. Happy belated Oatmeal Day, everyone! Do you have satellite TV available in Paris? We love our http://www.grandrapidsdishnetwork.com, here in Grand Rapids MI. I love your blog, I don’t understand either why you can’t just go into a cellphone store and get an Iphone if you want one. It must be so different there! is there a way to make this without the brown sugar or replace it with something else? I love this recipe and bought all the ingredients from Naturalia to make it – it ended up costing me 20 euros!!! Quite likely the most delicious, and also most expensive, breakfast cereal I’ve eaten! Yumi: If you’ve ever seen the people who eat at Costco, they’re pretty focused on their food. They are, obviously, serious eaters! Pratiba: I wasn’t aware that honey became toxic when heated. 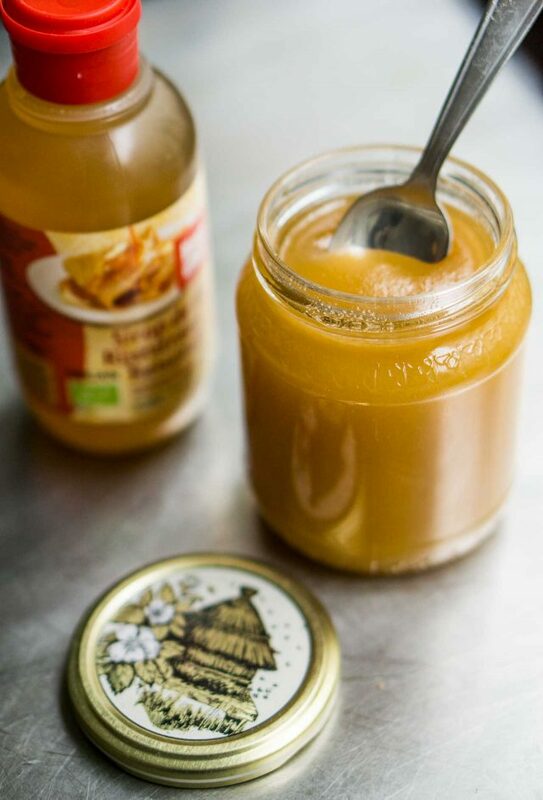 I know that ayurvedic theories state that you shouldn’t heat honey, but in this recipe, the honey is gently warmed to make it more fluid and I’m not sure how you would soften thick or crystallized honey without applying a bit of heat. I saw this and thought, “I must tell my friend Kerrin @ MyKugelhopf about this post – she will die!”. She’s a big granola fan. But she bet me to it. She’s found it. Commented. And no doubt already made it. Sounds like someone should go into the granola business in Paris, and surely, David, you should now do a post on le hotdog! Man that got people excited. I make my granola with the addition of hot water, too much softens the grains, but just the right amount helps crisp it in the oven, but can see that apple juice or other would work as well (just adds more sugar, inadvertently). But what an interesting idea about using apple sauce-never would have thought of that, and will try it. I use maple syrup in mine, though agave works nicely and certainly rice syrup or malt syrup could work as well. I found the mix of honey and maple syrup gives those nice crunchy bits we all seem to like. I also add flax seeds and both oat and wheat flakes with a little oat bran thrown in, lots of nuts and seeds and stir in cranberries or raisins when it’s cool. We have been making a very similar granola recipe for years and it is a big hit with everyone we share it with. We add walnuts and hazelnuts along with the almonds so that every mouthful has one or two nuts in it. Plus pumpkin seeds. Finally we also add ground flax meal once it is out of the oven and slightly cooled for all of its health benefits. We have used rice bran oil instead of vegetable oil. Once you see how easy it is to make your own recipe and store it in the freezer or fridge, you’ll never want to buy store made versions. i made an adapted version this afternoon with banana puree (had some overripe ones that needed to be used) and flax seeds, as i was missing the other ingredients. i’ll try apple next time, but the banana makes for both a lovely fragrance and flavor (it’s quite sweet, though – i’d cut down on sweeteners next time). yum! I’m back to report on the granola – so so good ! I made a half batch and probably should have made a double batch instead. Sweet but not too sweet and real crisp and crunchy, even though there weren’t huge clusters which are fun to pick out. I used maple syrup instead of rice syrup, and a mix of seeds- pumpkin, sunflower, sesame, buckwheat, flax and poppy. Turned out really great, I’ll be making this again for sure ! Having just butchered almost 400 grams of almonds I have to ask: How do you chop your nuts? (Sorry!) When I use my machine they turn out part powder, part large chunks. But doing it manually with a large knife isn’t that much fun, either. Are there any tricks? Sigrid: I used to be a stickler for hand-chopped nuts, for the reason that you mentioned. But I’ve softened up a bit and use a food processor most of the time. The trick with the machine, to avoid too-large pieces and nut dust from others, is to chop them in small batches (too many overloads the machine), and to make sure the blade is sharp. Like windshield wipes, those blades benefit from being replaced although you can also take them to a knife sharpener, which is a better solution. Kerrin: Glad you liked it. I this Cenk added cocoa nibs to his at one point. Rebecca: I haven’t bought granola in years but perhaps one of the natural food stores that I mentioned above might carry one that you like. I’m partial to Biocoop for dry goods, in general. Sonya: Yes, since bananas are starchy and sweet, it might be best to dial down the sugar, or simply thin it with a bit of water or fruit juice before adding it. I, too, am curious about what you would substitute for nuts if you were making this for someone with a nut allergy. My husband can eat peanuts and all kinds of seeds but not tree nuts. Maybe pepitas? What would you do? 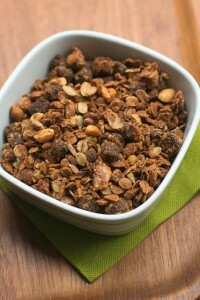 I just made my first batch of granola a few weeks ago and can’t wait to try this recipe. It sounds like the applesauce makes it amazing! Hi Robin: You could use peanuts if your husband can eat them. (And you do want to share your granola with him…don’t you?) I use pepitas in another granola recipe of mine, and they don’t burn, so they might work here too. Another commenter suggested Chex, which is an interesting idea as they’d certainly provide some crunch! 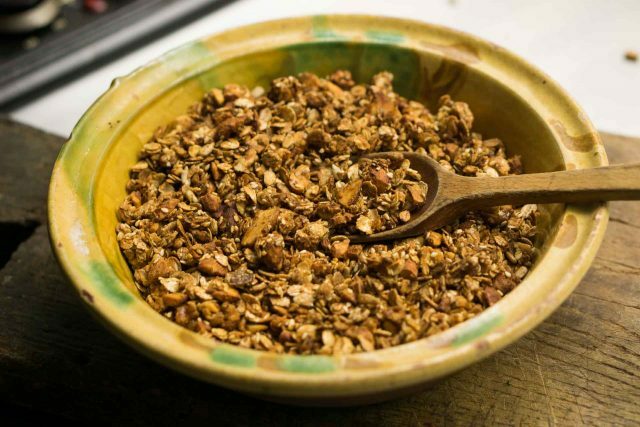 I have been making this granola for a few years now and it is so good (although I gave some to my mother in law and she cracked a tooth on one of the almonds and had to have a crown which I still feel ridiculously guilty about). I made the chocolate version suggested in the book last weeked -you just add 25g cocoa powder to the dry ingredients and use peanuts instead of almonds – and it is equally delicious with just a hint of breakfast time decadence. Delicious, crunchy, a really good granola. I found it a bit too sweet for my taste, though; probably will dial down the brown sugar next time, and add some dried cherries or cranberries for tartness. I’m a big fan of Cook’s Illustrated’s “toast and roast granola,” which contains no oil and only a bit of honey for sweetening–I recommend it highly. But this is a real contender. hey david, have been wanting for ages to make some granola.. my very first attempt ! but ummm i havent ever heard of or seen rice syrup around these parts……any idea on what i could substitute? honey? maple syrup? ninu: You can rice syrup in natural foods stores (like the ones mentioned in my post American Baking in Paris). You can also find it in Korean markets, like Ace Mart on rue St. Anne. In the post, I mentioned substitutions. David, thanks again for this recipe. I made a slightly altered version the other night – using what I had on hand – apple sauce, walnut oil and maple syrup. You’re so right about the crispy crunch. I just love it. I made a blog post about it – and the first comment was from a reader named Priya in India. She had just bought the ingredients to make the same granola! She made it with banana puree. This granola sounds awesome…..love the addition of fruit puree. I am looking for some alternatives to the daily oatmeal for the kids. Hopefully this recipe will work for them. 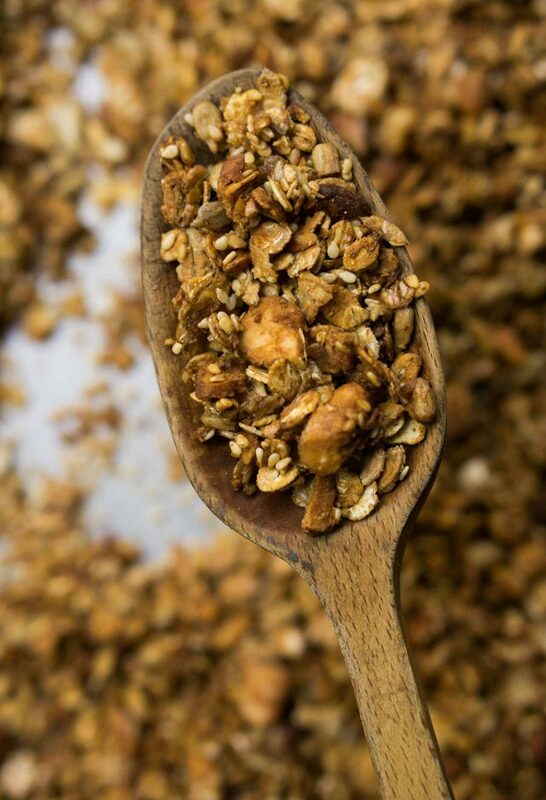 I don’t see why not….crispy, crunchy, sweet, carby granola. Who wouldn’t like that? Sorry to hear that you need to delay your iPhone. It really is a handy dandy computer in your pocket. They need to amp up the camera on it, but otherwise a lifesaver! I made this this weekend using agave nectar instead of rice syrup (rather than going shopping). Fabulous! I’m adding it to my Greek yogurt with dried fruit and a drizzle of honey. Next time I think I’ll try maple syrup and pecans in the recipe. Thanks! This looks really good, David. I can’t wait to try it, but I bet it is pretty calorie-intense. Oh well. Hi David: Just wanted to let you know I made this tonight (we’re going on a trip to Tulum this weekend, and I wanted to take homemade granola along as a breakfast snack) — and it was FREAKING AWESOME. I used black zapote for my fruit puree, which is this tropical fruit that looks like dark-chocolate brownie batter on the inside. It’s lightly sweet; most people in Mexico mix it with orange juice and drink it. Anyway: The granola was fabulous, I used pumpkin seeds and almonds and sprinkled a little coconut. You have hooked me for life as a fruit-puree-granola fan. Thank you! I Love this granola and in fact, just made it this yesterday for a friend. They actually buy the ingredients and bring it over and beg me to make it for them. It is really easy, very versatile and stays crunchy for a long time in the fridge. 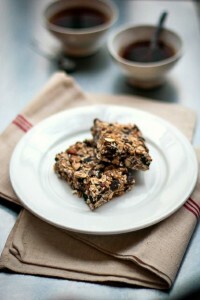 For those people who don’t like their granola too sweet, I use one extra cup of oats and then prepare the recipe as is. It comes out perfect every time. If you want super quick slightly burnt tasting granola, misread the recipe and bake at 400. I’m glad I was standing at the stove the whole time. I kept thinking, huh this looks like it’s burning and turning the temperature down. It still turned out great (after only 25 minutes). I didn’t have some of the ingredients, so I used some flax seeds instead of the other seeds, all honey, and added some vanilla extract to the liquid mixtures. It’s still quite tasty, even if a tiny bit burnt tasting. This is a great recipe, David. I made it for the third time today. The first time, our neighbors were making some kind of kale stew at the same time. Though I did like the outcome of my granola, I definitely did not like the mingling of scents. The second time I made the granola, those stupid neighbors of ours decided on goulash or something like it – I couldn’t believe it – it was around three in the afternoon! Well. However. Today was the third time and I delighted in the pure smell of cinnamon and ginger … I believe this batch is really, crunchily perfect. Thanks for your recipe! Thank you Thank you Thank you for posting this David! I have been searching all morning for the right granola recipe and you’ve posted it for me! I just finished letting the batch I made cool – and I have to tell you I am swooning. It is exactly as I had been hoping for granola to be. You made my day. Micheal’s Ruhlman blog just reminded me of this recipe (his granola entails making a fruit puree from scratch, which seemed like far too much work), so I made a batch of this last night. I’d just made some orange-ginger syrup, so I used that in place of the rice syrup and honey, and I made a few additional changes based on personal preferences and what I had on hand (scaled back on the sugar, nuts and seeds, added some flaxseed meal and dried mango, and used walnut oil instead of vegetable). 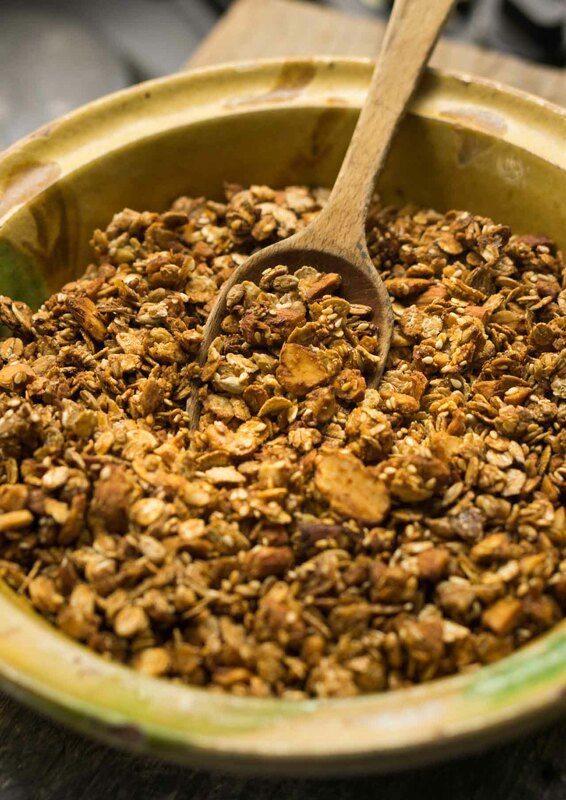 It is certainly the best homemade granola I’ve ever had– not too sweet or oily in the least. For American readers who like to use single-serving applesauce cups for baking, I found that 2 applesauce cups= 3/4 cups of applesauce. I should probably look up the nutritional value of this, because I’ve been eating it around 5 times per day, and I’m not sure if it’s meant for that.